ExCel Matrix Biological Devices (P) Ltd.
Confo-Cult® is designed to study differentiation/ cell functionality under 3D Cell Culture using fluorescence and confocal microscopic techniques. 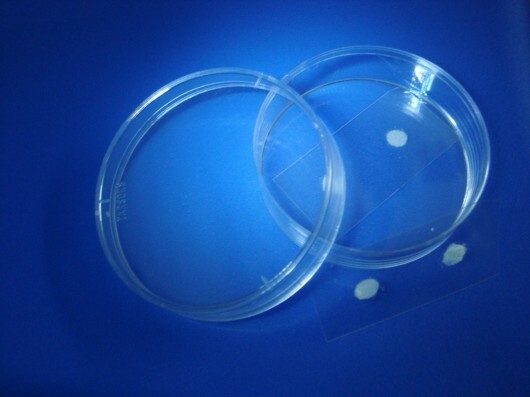 3D cell culture is performed on a slide that can be retrieved (unlike Dot-Cult®) from culture dish and mounted on microscope. Researchers not only can perform 3D cell culture using Confo-Cult® but also evaluate the performance using fluorescence and confocal microscopy for differentiation, proliferation etc. such integrated performance is not offered by any technology as yet. As an enthusiastic customer has expressed “it is fastest way to get a publication”. We guarantee an innovative touch to your research. Please discuss with our experts your unique cell culture requirements and explore options beyond conventional products. Physiological relevance of three dimensional (3D) cell cultures has made it a fundamental research tool in cell biology. 3D cell cultures are used in a broad range of cell biology research, including tumor biology, cell adhesion, cell migration, metastasis, angiogenesis and epithelial morphogenesis. Hydrogels like matrigel and collagen are popular among cell biologists to create 3D tissue model due to their ability to mimic extracellular micro-environment. Porous scaffolds of biodegradable polymers on the other hand, are preferred for tissue engineering research for 3D cell cultures due to robust mechanical properties. 3D cultures expected to decrease laboratory animals in drug screening and toxicity assays. Analysis of 3D cell culture requires delicate handling of 3D hydrogel from culture plates that may disturb the cellular arrangements. 3D cell culture samples are highly scattering due to thickness (few hundred microns) which is a challenge for microscopic analysis. Researchers very often prefer to grow cells on cover slips as monolayers for confocal microscopy studies missing the advantages of 3D cell culture. Innovations both in 3D cell culture formats and analysis techniques are essential to exploit the benefits of third dimension in the life sciences. 3D cell culture for advanced microscopy has been made easy and cost effective with Confo-Cult®. ECM Analog® coating of porous scaffold on typical cover slips makes it not only easier to perform 3D cultures but also simplifies confocal microscopic observations and high content analysis. Confo-Cult® is gamma irradiated and available in ready to use packing. 3D dots are available in two types of ECM material. Also available with 2D dot for easy comparison. Confo-Cult® is designed for 3D cell culture for Confocal Microscopy. Customizable Extra Cellular Matrix for 3D culture of specific cell types. Customizable scaffold features (pore size, particle size etc.). Handling is identical to monolayer culture. Cells do not grow on scaffold free area. Just add cells, media, and incubate. Multiple cell types can be co-cultured to create organ like features. Confo-Cult® is for research purpose only.